Fat Chicken is an upcoming #Steam release for Linux, Mac and Windows from Relevant Games and Mighty Rabbit Studios that features a unique take on the tower defense genre. The#game will look instantly familiar to fans of tower defense, but where traditional games in the genre tasks players with defeating waves of enemies, players must attempt to make the farm animals as large and healthy as possible before the waves enter the slaughterhouse. Water, feed and growth hormones can all be given to the animals from towers along predetermined paths, and players need to watch out for aliens and other hazards throughout levels and ensure their livestock reach their destination safely. Fat Chicken is currently available on Steam Early Access, with 15% off until October 24. Fat Chicken is a game with a good sense of humor. Players begin the game as a farmhand and toilet cleaner and will eventually earn a reputation for themselves and travel all around the world for their skill in leading farm animals to slaughter. The game awards players with slaughterbuxx for successfully leading an animal to the Fat Chicken Meat Co. slaughterhouse, and players can use the cash to purchase additional towers or upgrade existing towers all in an effort to fatten up the animals as much as possible while they travel through linear stages. Players will earn a star rank after each level based on the amount of meat they created during the level, and these can be used to purchase boosts for their towers such as faster shot speed or healthier animals. Additionally, heroes can be purchased between levels that give both a major boost and a disadvantage to players during the game. There are some really funny character designs for the game’s heroes that will definitely tickle a player’s funny bone. Gameplay in Fat Chicken is complimented by a fairly strong presentation. Fat Chicken is easy to pick up and play with controls that only ask players to use their mouse to change camera options, place towers or move around in-game menus. Fat Chicken has plenty of camera angles available, though it can be a bit difficult to follow all of the action with any view when speeding up the game to 4x its usual speed. One thing we didn’t like about the early build of Fat Chicken is a bare bones options menu that doesn’t allow players to enjoy the game outside of full screen mode, and no graphic options means the game will play and look the same no matter how good of a gaming computer players have. One surprising aspect of Fat Chicken is the game’s soundtrack. BAFTA award winning composer Jason Graves, who is well known for his work on the Dead Space and Tomb Raider series, created an exciting soundtrack with 17 original themes with farming inspirations. The different songs are very addictive and help make the game even more enjoyable than some would have expected from this once upon a time Steam Greenlight hopeful. Fat Chicken is a fun game with a lot of promise. The game offers addictive gameplay with its unique take on the tower defense genre. Players will love the humor the game offers as well as a fun soundtrack that really captures and elevates the farm settings. 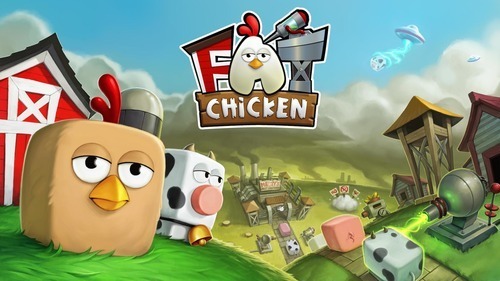 With 13 locations, 26 levels and plenty of unlockable upgrades and heroes, Fat Chicken packs enough content to keep players enjoying the title for hours on end, and it should be a successful release when the game arrives in Fall 2014. Fat Chicken is scheduled to release for Steam on LInux, Mac and Windows in Fall 2014. For more information on the game, check out the official Fat Chicken website.